Sioux City Foundry operates one of the most modern Ductile Iron Foundries in the US. 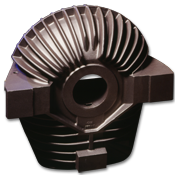 We supply high quality, competitively priced ductile iron castings throughout the country and around the world. Call 888-550-2564 and speak to one of our qualified sales professionals today. 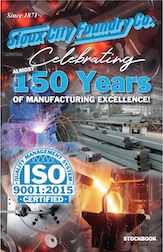 Sioux City Foundry is one of the oldest and most experienced quality Ductile Iron Foundries in the US. While ductile iron has only been around since the 1940s, Sioux City Foundry has been casting iron for over 140 years. 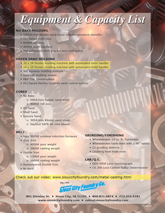 Sioux City Foundry is a modern, ductile, austempered ductile and ni-hard cast iron foundry. Located in Nebraska, we supply to customers in the Midwest, across the country and around the world with best-in-class products, service, and results. Our customers come from diverse sectors, such as industrial, engineering, decorative, architectural, and government, and all share the need for high quality products, competitive pricing and quick order turn-around. Our experienced and knowledgeable staff, combined with our modern production processes and up-to-date equipment, including new furnaces installed in 2009, allows us to provide our customers with quality products, services, and delivery. We can pour and repair custom metal castings from a few ounces to a several tons, and from 10 castings to 10,000 castings. We offer various mold sizes with green sand molding processes utilizing Hunter, Squeezer, and Rota-Lift systems, as well as the Flaskless no-bake molding system. We also produce oil sand, shell sand, isocure, and no-bake cores. 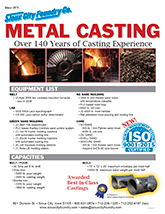 In addition to custom iron castings, we also offer in-house metallurgical testing, as well as offer heat-treat capabilities and specialty products, such as Pile Drive Hammers, Follow Blocks and Breaker Balls.